KIDWARE is a set of 17 cross-curricular software programs within an easy-to-use interface that promotes independent computer use in a classroom setting. KIDWARE's teacher utilities and tools make students' learning with the computer easy to monitor and track. The children's software programsare open-ended and exploratory in nature. 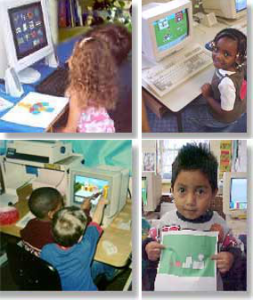 KIDWARE software programs enhance children's language usage, cooperative learning and social interactions while stimulating children's creativity and problem-solving abilities. KIDWARE software provides dozens of unique teacher utilities that enable you to customize computer experiences to suit the needs and interests of your students and help you manage their learning at the computer. Teacher tools facilitate lesson planning and record keeping, assess students' work, automate reporting to parents, make banners, draw pictures and use a simple word processor.